This is the tub we had the turtles in originally. 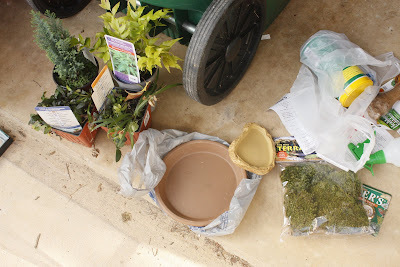 Here's the stuff to make the new terrarium. Went to PetSmart and picked up a 10G reptile tank with a screened lid. Already I'm thinking I should have gone with the 20, but this was $45 cheaper...I think there may be too many plants and the water is too big and not enough dirt for the turtles to dig. I mixed our natural dirt with some mulch to make it nice and loose for them to bury in and then chose plants from Lowes that we have in the yard. Julie says...Dave McShaffrey, who is the person who used to give me baby turtles to raise. Now he's doing better raising them himself. Yes... There are people who keep them going all year round but you have to use lights with UV spectrums that will both heat them and keep their shells hard--special reptile lights. Not cheap. You put them on a timer so the turtle gets a constant daylength. If the objective is to raise them as fat and as fast as you can, fine. 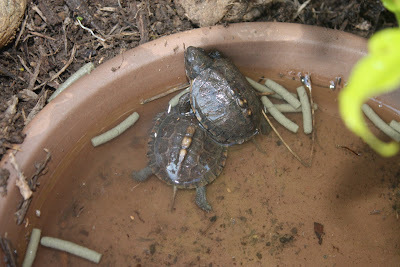 It is the shorter days that stimulate the turtles to dig in, as well as the cooler temps. Yes, of course they grow faster if they don't hibernate. I just have a gut feeling that turtles should be allowed to hibernate, since they'll be doing it in nature. I also have a good setup downstairs where they can be cold but still get natural light for basking on warm days. 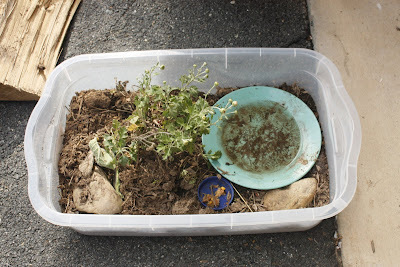 I keep the tank soil moist--the plants are good indicators when they need to be watered, as well as looking nice--and I keep a shallow dish of water full just in case they wake up and are thirsty. I dig my turtles up several times during the winter, just check them to make sure they are fine. Not a problem. The garage sounds pretty good to me. Just make sure, if they're going to be in a dark place, that they'll be cool enough there--I'm talking 30's and 40's, not constantly, necessarily, but a good reflection of outside temps. Make sure that mice can't get to them--screen the top of the tank. Mice will kill them. Make sure that they're truly sluggish and ready to dig in when you put them to bed--that they aren't interested in eating anymore. 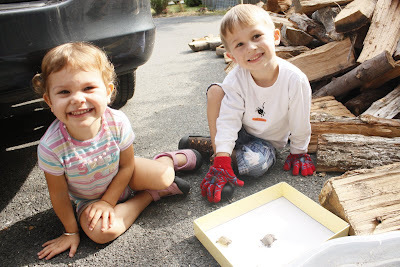 Watch to see that they are indeed eating the box turtle food. If so, good. You might get some Repto-Min sticks, soak them and add them in if so. Keep in mind that babies need more protein than adults, which is why I'm harping on the sticks vs. an adult maintenance formula. I use a 20 gal. long tank--more ground area. There are lots of good tanks for reptile keeping nowadays--be sure to get a screened cover. The turtle I just got eats hard-boiled egg; you could try that too. What, if anything, have your turtles eaten? Let's see what they're doing and we'll go from there. The reason I keep them is to raise them until their shells are big and hard enough to withstand attacks from mice, shrews and chipmunks. It can be a 2-4 year commitment depending on the diet. Repto-Min sticks make them grow like mad, which is what you want, and get them the calcium they need so their shells are nice and hard. Feel free to ask questions. Be aware that they should be winding down to hibernation now. Do you have a COLD spot in your basement where they can overwinter? Travis was out prepping the pool to close it yesterday afternoon; I was in the kitchen folding laundry...heard a knock on the door and there is Travis with the pool skimmer net in his hand. 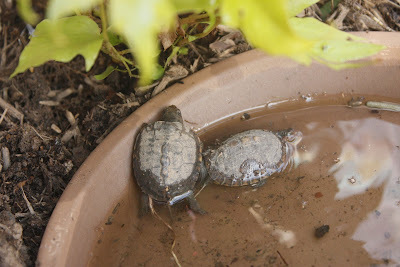 I open the door and he shows me that he has just pulled another turtle hatchling out of the pool. It was apparently just swimming around. How LUCKY is that? We haven't been out by the pool in days... that poor little guy would not have made it. We added him to our "terrarium". This one seems slightly larger than Max and I wonder if he's from another nest. 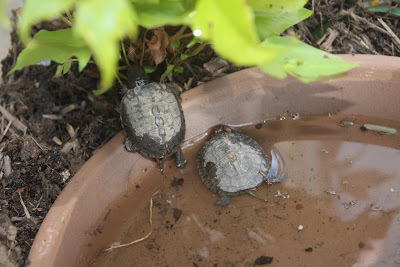 Wouldn't that be fantastic if we had more than one turtle laying eggs in the yard? We've never had nest before; despite seeing several different turtles. Our new "guy" will be named Lightning or Ruby depending on who you ask! "Recently hatched but has absorbed the yolk sac, so a matter of weeks old. Many times these little guys overwinter buried, which is probably why he was underground. Sure, he'll survive the winter. 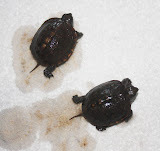 Rearing protocol is to feed Repto-Min Aquatic Turtle food sticks in a dish of very shallow water; the Brownian motion hopefully makes him snap at them. That's the best food. If not, small mealworms and earthworms are good. Young turtles are highly carnivorous. Don't be too surprised if he doesn't eat, either. I overwinter mine in a moist terrarium, planted, next to a cold basement door. I'm sure it goes down to the 40's some nights in that soil. I keep it watered over the winter. When it digs out and walks around in spring I bring it upstairs and start feeding it. 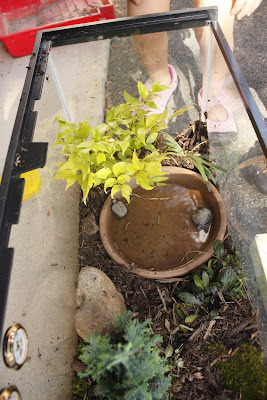 It will need a shallow water container with clean water and room to ramble around. I use a 20 gal. long tank with about 3" of potting soil in it,planted with ferns and begonias. I keep it by a south window for light and basking." Guess it's off to find a 20 gallon tank we can use to build a terrarium! This is a medium-sized terrestrial turtle that reaches a maximum length of about 8 inches. The shell is highly domed; color is brown, or sometimes black, with orange to yellow spots, blotches or lines, the pattern of which varies greatly. The underside (plastron) may be brown or black and may have an irregular pattern of cream or yellow. The adult may have a sharply defined beak on the upper jaw. The box turtle is so named because it has a hinged plastron that enable it to completely withdraw into and close its shell. The box turtle has a low reproductive rate and is long lived. It requires10-20 years to reach sexual maturity and reproduction decreases there after. Box turtles have been known to live longer than humans. Nesting occurs between late May and late July, with 2-7 eggs laid in one clutch per year. The terrestrial box turtle is found in many types of wooded areas, including hardwood forests, mixed oak-pine forests, pine flatwoods, maritime oak forests, hardwood swamps, and agricultural areas. It may also be found in pastures, especially in the edge areas, and occasionally, in caves. It enters water readily, but only temporarily, for summer aestivation, drinking, or dispersal. In hot, dry weather, the box turtle hides in pools of water, mud, or damp ground. It overwinters under several centimeters in the soil beneath leaf piles and grass clumps. The box turtle is an omnivore. Fruits include blackberry, mayapple, elderberry, sweet low-bush blueberry, maple-leaf viburnum, muscadine grape, white mulberry, wild strawberry, black cherry, and wineberry. Animals eaten are slugs, terrestrial snails, beetles, grasshoppers, caterpillars, flies, dusky salamanders, slimy salamanders. Mushrooms are also consumed. Captive turtles eat a wide array of food offered, in addition to the above. These include tomatoes, cantaloupes, mulberries, bananas, apples, plums, commercial grapes, earthworms, June beetles, mealworms, cockroaches, and hamburger.